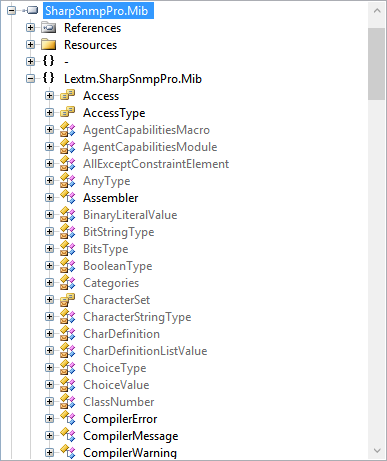 This page shows you the main features of SharpSnmpPro.Mib assembly. #SNMP Suite ships with an assembly SharpSnmpLib.Mib which can compile MIB documents and extract some information from them. It only provides limited functionality and users ask for more advanced editions. Here it comes. Now let us see a few common examples that reveal the power of this library. SimpleObjectRegistry is a class that holds metadata in memory. It can be used to import metadata generated via Parser.Compile. ErrorRegistry is the container of errors and warnings. When SimpleObjectRegistry.Refresh is called, all errors and warnings can be found in the ErrorRegistry instance, to help you identify why some MIB documents cannot be compiled or imported. The Trial version lacks of certain validation so it might not report all the issues, while the Full version does not have such limitations. SimpleObjectRegistry.Tree.PendingModules can be queried to see a list of modules that fail to be loaded. Similarly, SimpleObjectRegistry.Tree.LoadedModules is a list of loaded modules. Once the metadata are extracted from MIB documents, an obvious application of them is to enable OID translation. The translation is bi-directional (from names to OIDs or vice verse). We can see that if we are looking for SNMPv2-MIB::sysDescr (whose OID is 1.3.6.1.2.1.1.1), we can use SimpleObjectRegistry.Tree.Find method to locate the Definition instance. Each such instance contains one or more IEntity instances to match their entity definition in MIB documents. From Definition.DisplayEntity we can get one of the entities, and check its properties such as IEntity.DescriptionFormatted, IEntity.Status, and IEntity.Reference. Since SNMPv2-MIB::sysDescr is an OBJECT-TYPE macro entity, we can further cast it to IObjectTypeMacro to access more properties, such as IObjectTypeMacro.MibAccess and IObjectTypeMacro.BaseSyntax. It is obvious that the data type of SNMPv2-MIB::sysDescr is OCTET STRING. There are of course other properties you can review, which are documented online at the help site . The Trial version limits which attributes you can see, while the Full version does not have such limitations. With MIB documents, it is very easy to determine if an OID is a table, a table entry, or a table column. By accessing Children property of a table object, the entry of that table can be queries. Similarly, by accessing Children property of an entry object, the columns of the table can be queried easily. We can easily test if the data is valid for SNMPv2-MIB::sysDescr. The Trial version does only support data validation against a limited set of default types (defined in core MIB documents), while the Full version supports even custom types such as BITS, CiscoRowOperStatus, and CiscoPort.